Where should I put the code? How should I separate the code, put it in different files, with different namespaces or modules? Asking these questions at the beginning of the development is important. All these questions if answered correctly will lead to a good structure for the application. Answered incorrectly, or not even asked, will most likely lead to unmaintainable/fragile/rigid (or whatever bad adjectives for coding) code. Over the last few months, I have been working on a web app built in F# with WebSharper and came out with an architecture that caters to extensions and decoupling. Today, I will share this structure and hope that it will give you ideas and help you in your development. The ideas behind this architecture was highly inspired by Addy Osmani blog post on Patterns for large application and more precisely on modular architecture. The idea of a modular achitecture is that the application is composed by small pieces (modules) which are completely independent from each other. One lives without knowing the others and none of the modules have dependencies on other modules. The patterns explained in the blog post of Addy Osmani goes much deeper and defines many other patterns but to me the most crucial understanding is that we should strive to manage dependencies. Coupling is the worst enemy of large applications. It stops us from changing or removing pieces of the application and brings FUD in our daily development. I’ve been there… and it’s most certainly not fun. Core lib / common - Contains common types and services like auth. Shell - Combines pages, provides nav menu to the pages. The shell will do the necessary to gather all the pages, construct a menu based on the pages options and link the menu buttons to the correct pages. Page - Combines webparts to build a page content. Pages specify how they should be displayed (fullpage or with nav) and from where they can be accessed (from nav or just via direct url). A page can reference many webparts. Webpart - Combines modules in a reusable piece of the web app. Webparts can be considered as an assemble of modules which serve a common purpose. Therefore webparts can reference multiple modules. Module - Smallest piece of the web application. Dependencies flow downward only. Elements don’t reference other elements from the same level. Following this rule makes the structure very flexible. We will be able to easily remove or add pages. We will also be able to substitute a module for another in a webpart or substitute a webpart for another in a page without issues as they are independent from each other. Now that we understand the architecture, let’s see how we can apply it in F# with WebSharper. You can play with the app here http://arche1.azurewebsites.net/. If you aren’t familiar with WebSharper.UI.Next html notation, I wrote a blog post where I gave some explanations about the UI.Next.Html notation and how to use the reactive model Var/View of UI.Next. Following the architecture diagram, we place the common code in its own library. The Site project contains the Shell / Page / Webpart / Module categories. F# enforces the references direction. Only bottom files can reference top files, your functions must be defined first before you can use it. Therefore, if we keep the modules at the top level, it will indirectly make the module’s code have the least dependencies in the project. The domain contains all the domain types. One of this type is the Page record type which contains the information about how a page should be displayed and from where it can be accessed. Having defined the page earlier, we can write the code to compose the shell and the navbar. The links in the navbar are constructed based on the AccessOption and the DisplayOption is used to define whether the page will be displayed in full screen or embedded with a nav at the top. Each page is defined as a sitelet using the route and title and then all pages are sum together to form the main sitelet. [ buttonAttr [ attr.``class`` "navbar-toggle collapsed"
There are two modules within the Menu module. Client contains the code which will be converted to JS. Static contains the code that is used by the Sitelet to compose the page. In other modules, there might be one more module called Server which will contain the WebSharper RPC calls. Now the shell is ready to welcome all the pages that we define and we won’t need to touch it anymore (sounds like the open close… you know, open for extension close to modification). As expected, they define the title, route, content of the page, how it should be displayed and accessed. In our sample, the webparts are straightforward. But in other apps those might be more complex. 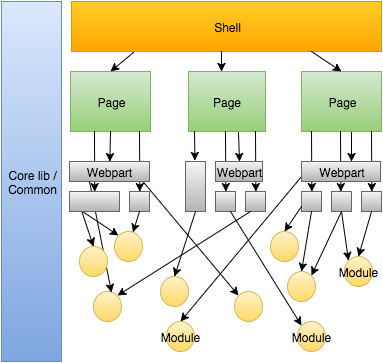 The role of the webpart is to combine the modules together to form a part of functionality that is useful to the user. Here we just need to combine the Map module with the LocationPicker module for the Map webpart and same for the Weather webpart. panel is a helper defined in the Bootstrap module in Common. You can find the full code here. The Weather webpart uses the LocationPicker module which returns its content plus a view on a location variable. The Weather module takes a location view and uses it to display the weather for this particular location. It is important to note that the LocationPicker module is not directly used in the Weather module. Weather module accepts a view as an argument, it doesn’t matter where the view comes from. It is the role of the webpart to bind the LocationPicker module location view result to the Weather module and to ensure that LocationPicker is not dependent on Weather and vice versa. Modules should not reference each other. To get the weather, I used http://openweathermap.org/api. Using the JsonProvider from FSharp.Data simplifies the interactions with the open weather api. We provide a RPC call which returns the Forecast depending on the city given. RPC allows Server calls to be called from Client code. Serialization is handled automatically by WebSharper and we can use the same types returned from the Server in the Client. For the Client, we construct a reactive doc based on the city given. Everytime the city changes, the RPC is called and the doc is updated. View.MapAsync: ('A -> Async<'B>) -> View<'A> -> View<'B> takes as first argument a async function which is ran every time the view is updated and returns a view of the result of that async function. It makes it easy to combine view operations since we don’t need to bother about their async nature. Modules are the last element of the architecture. They must be completely independent and can be added or removed with ease from webparts. Today, we have seen one way of structuring a web app which reduces coupling between elements and allows rapid changes and adding new features easily. We have built a shell which doesn’t need to be touched anymore and automatically add links to its menu based on the pages that are registered. Finally this structure also remove the confusion of where to place code and defined a clear way for components to interact with each other. I hope that this post will help you in your developement and I hope you enjoyed reading this post as much I enjoyed writing it. As usual, if you have any questions, you can hit me on twitter @Kimserey_Lam. Thanks for reading! You can play with the web app here. Hi Kimserey, nice blog post! I actually wonder if it is possible to have a nicer developer feedback loop for WebSharper projects. Other Web technologies are allowing a more immediate feedback loop, like for example elm (built in), clojurescript (with figwheel) and even react (with react-transform) where you can save your file and the changes get propagated to the client (without a browser refresh and the app-state is preserved). This developer experience would be awesome to have with WebSharper! Do you know a way to get this work with WebSharper? Hi Tobias, thanks for reading! What I demonstrated in this post was how you could use WebSharper Sitelet which build a complete backend + frontend. The console app is needed to host the backend therefore we have to rerun the whole thing when we make changes. If your interest is mainly on building a frontend SPA, you could have a look at WebSharper.UI.Next which is a reactive library that can be used to build frontend apps. But with that said, you will still need to recompile every time you change your F# code since WebSharper generates the .js file during compile time. So the steps would still be "compile project + refresh browser". I do believe that this could be made easier with a fake script, by detecting when the file is changed and recompile the project so that you would only have one step left which is "refresh the browser". yeah, I've seen that "trick" with fake a couple of times in conjunction with suave (http://stackoverflow.com/questions/34603913/suave-in-watch-mode-during-development). suave as the server and WebSharper.UI.Next for the frontend sounds interesting! but do also check the docs in the github repo as those seem to be more up to date! I will have a look! Thx! Thanks for writing about this. This sort of structural issue is just what people considering WebSharper need in order to help them decide if and how to adopt it. Some thought provoking ideas. + thanks so much! Your blogpost is what I was looking for (and couldn't find anywhere else). This sample of project structure (or something similar) even could be great for WebSharper project templates - the current ones are not good for bigger than example apps as seemed to me.